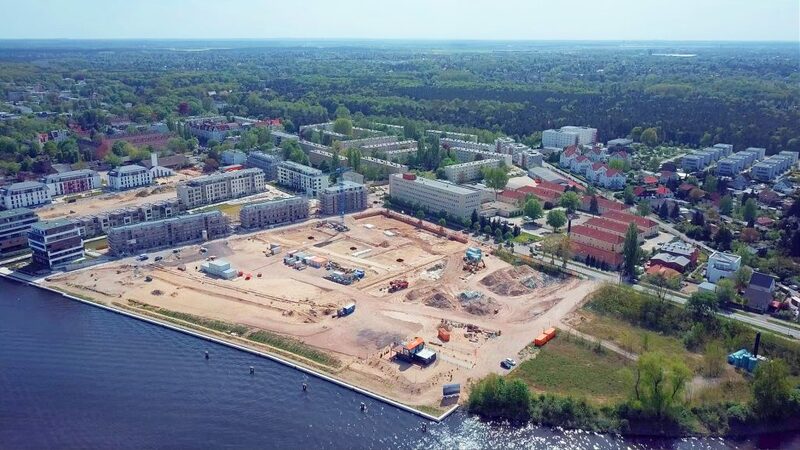 The southeast of Berlin is booming: a marvellous residential location and good transport links to Alexanderplatz, WISTA Adlershof and the airport intersect here. 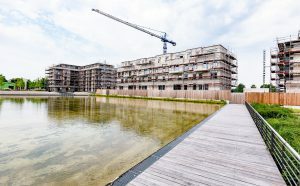 A sustainable residential district is currently being built in Grünau, between Regattastrasse and the banks of the Dahme. At the info day on 16.12.2018, BUWOG’s project experts will present a great deal of interesting information on the metamorphosis of the approximately 100,000 sqm site. Concerning questions of sustainability and regarding recreational and residential qualities, the quarter is pioneering. The centrepiece of 52° Nord is the specially constructed 6,000 sqm pool into which rainwater from the surrounding buildings gathers. Lateral vegetation and biological substrate filters and ensure top, even scientifically substantiated water quality. The project receives continuous support through researchers from TU Berlin. There are also plans for childcare at 52° Nord. The quarter’s own daycare centre will open in 2019, providing space for 75 children aged one year and over. Socially, sustainably and architecturally of value: those interested in assuring themselves of the qualities of the neighbourhood can do so at the info day event on 16.12. 2018. Interested parties are asked to gather in the information centre at Regattastrasse 11, 12527 Berlin. Guided tours in groups of a maximum of 15 people are free of charge and last around 30 minutes. Registration is not required. Sturdy footwear is absolutely necessary for inspecting the premises. An inspection with prams is unfortunately not possible. The focus of this info day are the next building sites and available condominiums. Interesting for real estate buyers: sales have just begun for BUWOG THE VIEW. The five-storey ensemble will extend a total length of around 150 metres along the shoreline. Distributed across the three buildings, BUWOG THE VIEW offers a total of 63 condominiums with a direct view of the water. Buildings I and III were designed by the architectural firm PA GmbH Pätzold Architekten of Berlin. The façades of wood and reddish Corten steel are reminiscent of ships’ hulls. 35 condominiums with two to four rooms of 58 to 145 sqm are located here. All of the apartments provide direct views of the water with panoramic floor-to-ceiling windows. Centrally located Building II opens to the east and west with its façade of folding glass walls. Large balconies and terraces facing the water are connected through optically floating jetties. 28 condominiums of 1.5 to four rooms and 64 to 128 sqm are being constructed in Building II. The designs stem from the renowned architectural firm LOVE architecture and urbanism of Graz. Here design lovers will find the typical, slanted outer pillars, which the architects at LOVE already created at the company headquarters of 50Hertz in Europacity, Berlin. Responsibility at BUWOG: Senior Communications and PR Manager and Press Spokesperson for Germany. I am responsible for press relations in Germany at the BUWOG Group. Together with the Marketing & Communications team, I organise the contacts to the media and the public and provide comprehensive information. I was previously employed as a journalist for various print and online media and as marketing and communications manager in various companies in the trade and services sector. I love discovering new issues with "journalistic curiosity". The BUWOG Group has plenty of exciting stories – from land acquisitions to various development projects to corporate issues. Here in BUWOG's blog I report on them and look forward to providing insight into a wide variety of areas. Please use your real name when posting a comment.